PRODUCT DESCRIPTION: Mechanical device which looks like a large spider and is activated by movement. When activated, it will release an 18 inch length of cord which causes it to drop down from where it is mounted. Motion, movement and vibrations will activate it and most any bird landing close will cause it to trigger off. Commonly used to repel woodpeckers, this visual repellent can be set out to chase away most any bird including starling, pigeons, ducks, geese. vultures, sparrows, swallows and more. This device looks like a large spider complete with legs, head, eyes and mandibles. Two "AA" batteries power the spider and there is an on/off switch located on the bottom (batteries are not included with the Spider). You will need to use a Phillips head screwdriver to remove the side panel for loading the batteries. This panel is located under the fur of the spider and held in place by Velcro. There are two eye hooks for mounting the spider onto siding of the home which are best suited for screwing into wood or stucco. Mount these above the area you want to protect and place the spider flat against the surface of the material you want to protect. When the nuisance animal returns the spider will be activated and this motion will scare away the target animal. 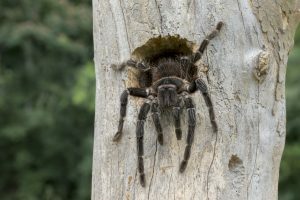 Birds are naturally afraid of spiders since several species will actively feed on them including this large tarantula. In this picture you can see the tarantula leaving a woodpecker nest. 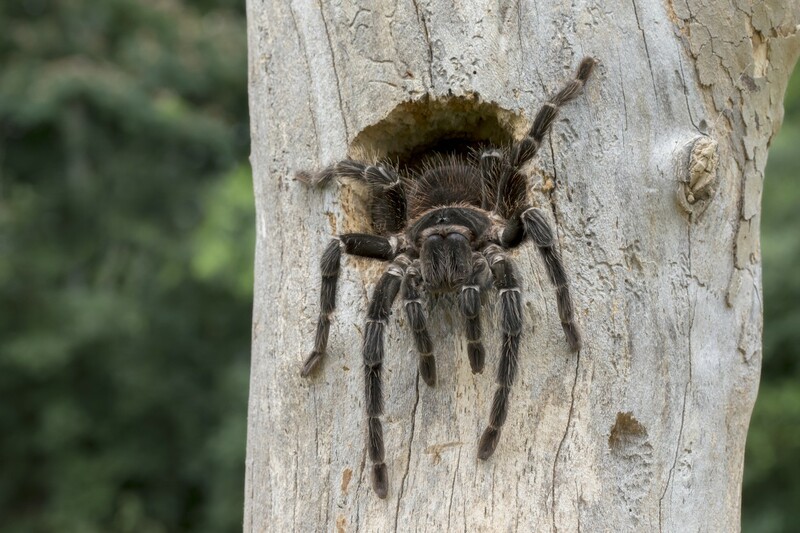 Tarantulas love birds, especially baby birds, and thousands of years ago they no doubt fed on a wide range of bird species. This predatory nature no doubt has effectively "wired" birds to be naturally afraid of any spider they encounter including very small spiders commonly found around the home. WHERE TO USE IT: Siding of the home or any structure, up under eaves and along window frames, moldings and fascia boards. Can also be used on trees, poles and other objects where you don't want small animals or birds active. Try to keep the spider out of direct rainfall. Though it can tolerate getting damp or wet, repeatedly getting soaked due to rain or irrigation systems will lead to damage and component failure which is not covered by warranty. RATE OF APPLICATION: One spider per 10 foot by 10 foot area. 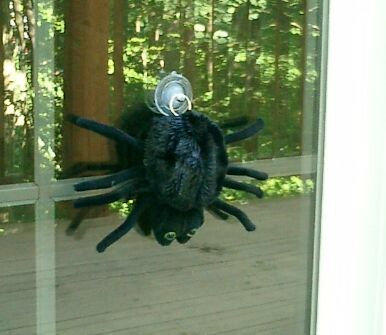 When used on windows, you will need one spider per window you want to protect. Attack Spider works great! Was having a problem with woodpeckers every day. Since I hung the attack spider on the eve of the house I haven't had a single woodpecker. Great product. I think they will work. I have tried everything else for this damm woodpecker. I'm setting up 6 of these and so far no more holes. At first he kept moving around the house but now, the whole house is covered and by the time the batteries die, he will also! G.
I first bought 3 and hung them where one woodpecker was drilling a 1 1/2 inch hole and making his home in the top of the 2nd floor window trim just a foot from the eves. Boom, he moved around the other side of my stucco house. He is tenacious. I now have 12 spiders hanging around the eves of the house and no new holes. Its only been a few weeks but I believe this is the cure. I also think just the visual of these spiders scares him now. Ill keep them up for a year to make sure he doesn't return. Very pleased with the spider. No more pecking at 6 am. However, spider is soooo sensitive that a good hard rain storm has him dancing all day. All in all, it was the best solution for a very annoying problem. Works like a charm! The attack spider arrived Halloween day. What better way to test it's attributes. 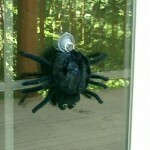 A knock on the door is all it took and the spider jumps, I mean drops into action. I haven't found out yet if it will take care for the Woodpecker problem I purchased it for. I was skeptical that the tapping of a bird would activate the mechanism. Now after experimenting, I have no doubt. I believe it will do the trick… no pun intended. Thank you from Cape Cod. I live in an (apparently) delicious log house and have a couple pairs of pileateds who like chopping at the ends of the logs. I put one spider on each corner of the house and so far (three weeks in) they have stayed away. The spiders are very sensitive to noise, so I rigged them on strings to lower them to turn them off when I shovel or know I'll be making noise. Gave one to a friend in a cedar house and the woodpeckers are staying away from her place, too. They work!